And see how they got on. SINCE BACK IN September, homebrewers around the country have been busy at their buckets and bottles preparing Christmas ales for winter. We even got into the brewing process here at TheJournal.ie, with our journalists, sales bods and tech team brewing three different types of Christmas ale in the office kitchen. All of these brewers – from seasoned hobbyists and aspirational amateurs to everything in between – were working towards a common goal: the Smithwick’s Homebrew Challenge. Two months ago, Smithwick’s partnered with the National Homebrew Club to challenge Homebrewers across the country to submit their recipe for a Christmas ale. There were over 240 applications to the Homebrew Challenge, with two final favourites selected through a tasting session packed with beer experts. These finalists were invited into in the pilot brewery in the historic setting of St James’s Gate in Dublin city centre to brew their recipes. From this, the duo Stephen Ryan and Brian Mooney from Celbridge were chosen along with Sebastian Kondol, originally from Poland now living in Dublin for the last ten years. They were invited into the Open Gate Brewery at St James’s Gate, in a first for the brewery, and got to check out the brewing experience from start to finish. Stephen started brewing first, about two years ago, when his wife bought him a brew kit as a gift. Once I saw the brew kit and tasted his first brew… I knew it was something I wanted to do. After a few months of brewing separately, we joined together, it’s more fun now – we get to experiment on more new beers together. I’ve brewed over 100 batches and each year I have always brewed a special beer for Christmas time. This year will be incredible as I will get to enjoy the beer that I create in St James’s Gate with my friends in the pub. There was huge variety in the 70 entries that came in and were tested – from nuts and spices to honey and chocolate. Stephen and Brian’s – dubbed Old Town Christmas Ale – was a medley of cinnamon, nutmeg and star anise, while Sebastian’s Apple Pie Ale, inspired by his mum’s apple pie, concentrated on apple, cinnamon and spiced ginger flavours. This is the first homebrew competition we’ve ever entered, and only our second attempt at an all grain beer – and now we’re getting to brew in St James’s Gate. My middle son questioned if I was even this excited and happy when he was born. Natasha Alves, a Smithwick’s brewer in St James’s Gate who had been involved in the tasting and scoring process, said the recipes the finalists had entered “nailed it” and that she was “blown away” by the beers they created at home. While both teams really want to win, of course, they feel that even having got as far as they have has been ‘a dream come true’. The next step in the Homebrew Challenge is picking an overall winner – and that will be down to the general public (that’s you). Over the coming weeks, each brew will be available for sampling in 10 pubs around Ireland, the locations of which will be announced on the 1st December 2015. If you would like further information about the Smithwick’s Challenge visit www.smithwickshomebrewchallenge.ie or to learn more about homebrewing and to pick up some tips visit www.nationalhomebrewclub.ie. 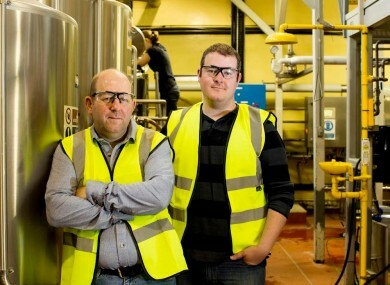 Email “Lucky homebrewers got the chance of a lifetime to brew their recipes in St James's Gate - let's meet them”. Feedback on “Lucky homebrewers got the chance of a lifetime to brew their recipes in St James's Gate - let's meet them”.